Paying Ready Attention: A sock in the washer. A sock in the washer. 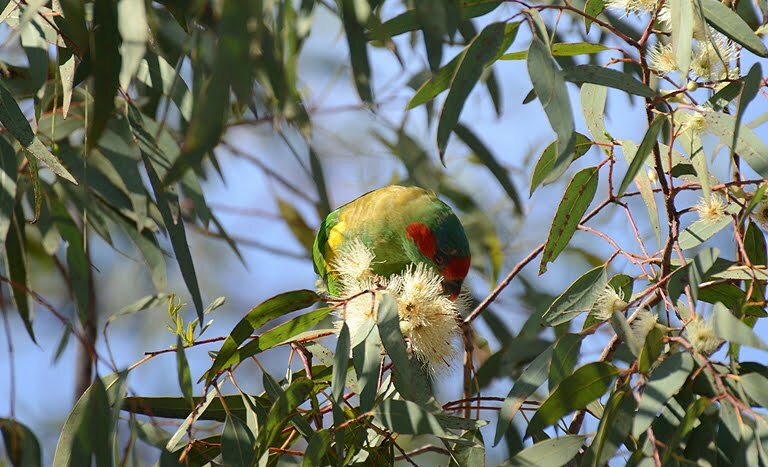 Out in the car park Musk Lorikeets chatter in the trees, higher pitched and less terse than their Rainbow cousins. Some flutter their wings in submission or possibly courtship. Some dash along the length of branches in short sharp movements, their feet hidden by fluttering wings. They look like second rate stop frame animations, where all the money has been spent on colour rather than continuity. Their short pointy bodies and short pointy tails turn them into flying crosses. They fill the morning quiet with their voices and the morning sky with their wings. I pause to watch, then walk towards the pool. The glide off the wall is a silky surge of freedom. You pop up to the surface, take one stroke and breathe. Three strokes, right. Three strokes, left. Repeat, repeat, repeat. I reach the far end and turn gracelessly. A fumble turn. Glide, stroke and breathe. Use your feet more. Lift your elbows. Watch the way your hands enter the water. Be here now, in this moment. Not watching TV in a hope that the time will pass, not counting seconds of sprinting. Arm over arm, kick after kick. The minutes pass and I try to keep going. Old men who have swum everyday for the past God knows how long plough up and down. Younger people with worse technique and less stamina than me rest at the wall. Eventually I join them. But it’s a later ‘eventually’ than last week. I dream of otters, of salmon, even of narwhal. I keep swimming. Out in the car park the Musk Lorikeets are still there, with Noisy Miners and Wattle Birds. On the gravel path a small flock of sparrows half jump, half fly from puddle to puddle. Red Rumped Parrots look for seeds on the edges of the oval, and in the distance I hear a Butcher Bird. A dog Fox – or possibly a foxy dog – trots across the road in front of me. It sniffs the body of a dead possum and keeps walking. As I wait for a green arrow I see it walk over the cricket square, move down to fine leg and disappear over the boundary. Six and out. As I pull into my own driveway the car clock flicks over to 7.45 am. As I open the front door I can smell toast. It’s a good way to start the day. Later in the week I swim in the ocean. Technically its summer, but you would be hard pressed to know. 7mm of neoprene should do the job. The wetsuits are blue on the inside and black on the outside, and I hope that they will stop me going blue on the inside. I help H into his suit. His arms stick out at a strange angle and I assume mine do as well. We waddle down to the Pier. We are at Portsea again, looking for sea dragons. The wind pushes the water against the shore and the sea looks choppy and dark. For reasons that I fail to understand at the time we are going to jump into the sea from a low platform rather than wade in from the shore. There are two other families with us and they seem less than keen to get in. So I go first. There is only a slight northward migration of parts of my body as I enter the water which surprises me. The group leader had described the water as brisk, a word I had taken to mean almost debilitatingly cold. H jumps in after me and almost lands on my head. After a few moments of shock we both start to swim around. The other families still seem less than keen. Eventually everybody is in the water. The waves which looked choppy from the shore now look much larger. My eyes are at water level and the waves are way over the top of my head. Me and H bob like small corks in the water – we swap OK signs and head for the pier. It quickly becomes clear that the water is not. It’s a murky soup of foam and falling sand, of swirling bubbles and floating weed. The swell from the wind pushes us uncomfortably close to the wooded piles of the pier. I catch a brief glimpse of small fish and coloured weeds. I get a much closer view of somebody else’s fins as they kick me in the face. We head away from the pier and out towards more open water. In the open water I feel even smaller than before. The shore is really not that far away but you still lose sight of it in the dips of the waves. People cling on to the floating ring we have brought with us. This increases the sense that we are in a ship wreck of some kind. A few small fish dart away into the weeds and we find a sea urchin and a star fish. But mostly we just see waves. In a miracle of observation we find a Flathead in the weeds. Named with a wonderful economy, this fish has a flat head and most the rest of it is flat as well. They make good eating, but after a few minutes it moves off and disappears into the gloom. Some of the other snorkelers move off as well and head back to shore, beaten by the chill of the water and their unwillingness to swim to keep warm. H is doing OK, but I can tell he is not having the best of days. We head back to swim beside the pier. There are more fish here, but it’s just not a good day. When we try to get out of the water and on to the beach the waves bounce us around and taking off the fins is a nightmare. H gets cast up on some rocks and looks less than pleased. I fall over and H cracks up. We both end up being bounced around in the surf like socks in a washer. The other swimmers are gone by the time we get back to base and stand under thankfully warm water. We struggle with the wet suits and think of coffee or chocolate. But strangely it is a good day. Not everything goes to plan, but that’s normal. Wildlife is unpredictable – if you want certainty, go to a zoo. The water was cold, but it’s possible (for a while at least) to look after yourself in the ocean. In the car on the way home we spend as much time talking about the day as if we had seem heaps of stuff. The next morning as I glide off the pool wall I find myself laughing. I can see us bobbing in the water, like half drowned corks, trying to make the best of it. I take a breath and keep on swimming. I wish you had actually seen a leafy seadragon. All that effort and cold but still seeing anything in the sea is a thrill in itself and worthwhile the effort. I like your way with words, it is always a pleasure to read your posts. I love your description of the swim in the cold sea...makes it come alive. A wonderful post Stewart.. many thanks for sharing it.. Sorry I should have added..the image was on Flickr. Great post -- made me feel like I was there. I've done the swimming pool thing many times -- it is a great meditation Zen-like thing as well as good exercise. Wish I could say I've enjoyed snorkeling. Clausterphobia surfaces every time I've tried. Your pictures are beautiful, even if it wasn't the clearest day and I look forward to seeing more when you have a more favorable day. Scuba diving is great fun - although it's much nicer in warm water. I learnt to scuba dive off The Great Barrier Reef. Hope you get your Internet problems sorted out! A great post today. I love snorkeling but only in warm water. You do a great job describing your swim! you gave it your best shot! Shame the water wasn't so co-operative on the day. A bird in the hand - two dawns.